complies with the certification instructions of the Customs Union and/or member countries. On approving certificates, Ukraine has individual contracts concluded with the member countries of the Customs Union. Marks of the Customs Union certificate are EAC, EAC Ex (Eurasian Conformity). Sometimes it is referred to the TR CU certificate, implying the same. EAC certificates do not have a certain value. The certificate price depends on many factors, including the product itself and its purpose, need for testing, need to register, for example, state registration, other certificates, obtaining the fire certificate and type of the requested certificate. Term of the certificate issuance depends on the factors mentioned above. As a rule, it is issued within 2-3 weeks. "Markinvest" implements "one window" principle. In addition to the optimal solutions, our certification clients receive a report on all the required documents, tests and other necessary permits and certificates. 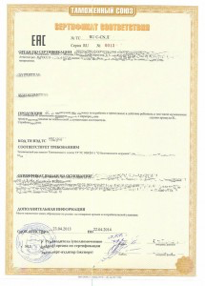 "Markinvest" Certification Service which is specialized in rendering consulting services will provide assistance in the preparation of the following necessary documents: GOST R, GOST K, UkrSEPRO and BelST, will organize tests, protocols, production inspection and supervise the entire process of GOST R, GOST K, UkrSEPRO and BelST certification. According to the Customs Union agreement, certain products are subject to health and epidemiological control (inspection). - Household chemicals, film and synthetic materials, textiles, materials for sewing and embroidery and so on. Some products require state registration (with the health and epidemiological control authorities). - Mineral water, soft drinks, beer, specialized food products, such as baby food, food for pregnant and nursing women, dietary products, bioactive additives, cosmetic products, products for oral hygiene, disinfectants, household chemicals, potentially hazardous and biological agents, various materials, drinking water outfit, equipment, personal hygiene products for children and adults. Mandatory certification in the Customs Union (confirmation of conformity). EAC certificates and declarations. The process of the declaration issuance is relatively simple: The declarant declares that the product complies with the requirements; the certification body verifies and registers the declaration. Data on the registered declaration is placed in the Unified Certification Register. The declaration bears the seal of the declarant and information about the manufacturer. The process of obtaining a certificate provides, in general, the tests and possibly the production audit (1-2 experts become acquainted with the organization of production and quality management system). After this, the certification authority prints the certificate and assures it with the seal. Thus, the certification body takes on more responsibility. Data on the certification is entered in the Unified Certification Register. Only goods produced at manufacturing plants approved by veterinary and sanitary expertise of Russia and Federal Service for Veterinary and Phytosanitary Surveillance can be imported into Russia. Veterinary and sanitary expertise of Russia and Federal Service for Veterinary and Phytosanitary Surveillance are to decide on the approval of the manufacturing enterprise, producing fish, meat, milk and fodder for registering goods export. "Markinvest Oy” has 24 years of certification experience in Finland and Russia. 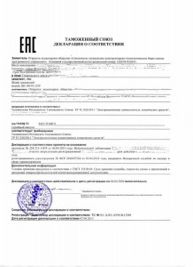 We carry out certification together with the reliable certification companies and competent experts in Russia, Belarus, Kazakhstan, Kyrgyzstan, Armenia and Ukraine.